Major oil trading houses are predicting the return of $100 crude for the first time since 2014 as the market braces for the loss of Iranian supplies because of U.S. sanctions, Bloomberg reports. Mercuria Energy Group Ltd. co-founder Daniel Jaeggi said prices may spike to over $100 a barrel in the fourth quarter because the market doesn’t have much capacity left to replace more than 2 million barrels a day of Iranian exports that could be lost to sanctions. Trafigura Group co-head of oil trading Ben Luckock sees $90 oil by Christmas and $100 in early 2019. Brent crude, the benchmark for more than half the world’s oil, was trading up 1.6 percent at $80.02 a barrel at 1:34 p.m. Singapore time. When Trump in May announced plans to reimpose sanctions on Iran’s oil exports, the market estimated a cut of about 300,000 to 700,000 barrels a day, according to Trafigura’s Luckock. However, the consensus has now moved to as much as 1.5 million barrels daily as the U.S. is “incredibly serious” about its measures, he said. “It’s going to be significantly less than it was, and probably lower than most people expected when the sanctions were announced -- hence the higher prices,” Luckock said at the APPEC event. In addition to U.S. sanctions cutting Iranian supply, the world is also dealing with a decline in Venezuelan oil production due to an economic crisis in the Latin American nation, according to Trafigura’s Luckock. 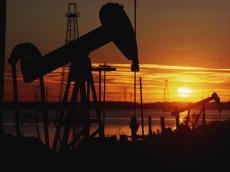 The biggest source of new global supply, U.S. shale, is also experiencing growing pains as pipeline bottlenecks and workforce issues may hamper growth, he said. Citigroup Inc. also flagged the possibility of triple-digit crude prices in a Sept. 24 research note. “While Citi is pricing in Brent (ICE) crude at around $80 for the quarter ahead, balances are precarious and the lack of spare capacity could see crude pricing well above $90 or even $100 should all of the potential risk in the market materialize,” analysts including Ed Morse said in the note.